V. Guerra, Diaz & Co. 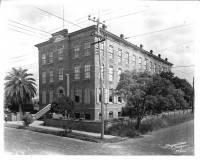 In July 1903 V. Guerra, Diaz & Co. opened a branch factory in West Tampa at a factory building on Armenia Ave. & Oak Street. When the Leopold Powell & Co. moved in 1904 to the factory building vacated by A. Santaella & Co. and later known as the San Martin & Leon factory building, V. Guerra, Diaz & Co. moved to the recently vacated factory building. V. Guerra, Diaz & Co. consolidated all its manufacturing operations at this location when the great West Tampa fire of April 4, 1904 destroyed their West Tampa factory. This three-story 27,462 square foot cigar factory at 201 N 26th Street was built in 1899 for their V. Guerra, Diaz Cigar Co. by Spanish immigrant from Asturias Vicente Guerra and his nephew and son-in-law Frank R. Diaz. Until that year Guerra and Diaz had operated their factory at the Corina factory building a few blocks away, but in 1899 the Cuban American Cigar Manufacturing Co. acquired the Corina facilities and made Guerra its Vicepresident and General Manager, position he held until his death on January 1909. Vicente's interests were then managed by Frank Diaz and Joseph Guerra (brother?) who had been a former manager at Corina. This factory building was known at times as "La Mega", “La Matilde” and “El Modelo”, V. Guerra, Diaz & Co. best known cigar brands along with La Flor de V. Guerra, Diaz & Co., La Notica, La Ahles, La Copiosa, Don Vicente and Artemo. V. Guerra, Diaz & Co., occupied the building until 1943. During the 1940's it was shared by Tampa Tiger Cigars, Haas Cigar Company and John Marrian Cigars. It served as a naval barracks and training facility during WWII. Beginning in 1956 and until the 1970's, it was occupied by the V. Guerrieri Cigar Company. On July 5, 2015 just past midnight, the building caught on fire which firefighters were able to contain, however, the building collapsed around noon that same day due damage to the second and third floors. Before the fire occured, a sign in the front yard stated that Acuity Commercial Services was in charge of selling the abandoned property owned at that time by 201 26th Street North LLC. for $1.6 million. A picture of the building including some interior photos during its last years can be seen in this page of the website Abandoned Florida .